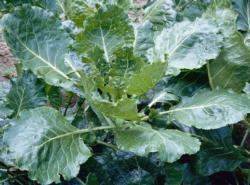 Pest management: Collards are in the cabbage family, and pests are similar across the family. This group is also known as cole crops or brassicas and includes broccoli, cabbage, and cauliflower. Collards are a cool season vegetable grown for their leaves. They do not form a head like cabbage. Direct seed or transplant Feb–Apr (maybe May) or Sept-Oct (maybe Aug). If growing from seed for transplanting, expect six weeks for the plants to be ready. Harvest individual leaves after plants are well established, about two months after planting. Some people prefer to harvest the younger inner leaves rather than the older, outer leaves. Collards tolerate a wide range of warm to cold temperatures, and like many members of the cabbage family, will taste sweeter after a light frost. For close plantings (6–12" apart), thin by cutting some plants at the soil level when crowding begins. For wider spacing (15–18" apart), harvest lower leaves to allow the plants to continue growing and producing more leaves.